What is the ACT Services Access Card? If you have a Protection Visa Acknowledgement (PVA) letter from the Department of Immigration and Border Protection then you are eligible for an ACT Services Access Card. If you are eligible, you are able to get a card for you and each of your family members for a period of six months. The card, a sample of which is pictured below in its actual size, can easily fit into your wallet or purse and can be used as a form of recognition when accessing services with the aim of providing an easier and faster experience and outcome. An asylum seeker is an individual who is seeking international protection. In Australia, an asylum seeker is a Protection Visa (PV) applicant who has not yet received a final decision on their application from the Department of Immigration and Border Protection. Not every asylum seeker will ultimately be recognised as a refugee, but every refugee is first an asylum seeker. Asylum seekers can feel extremely vulnerable because they have an uncertain future - they have left their old lives behind, but they cannot start planning and living their lives with certainty until they know the outcome of their protection claim. This uncertainty and vulnerability can cause much stress and pressure in their lives. By showing their ACT Services Access Card, asylum seekers can decrease the stress or trauma of retelling their story again and again. The ACT Government is committed to providing the fairest society possible for all Canberra residents, and that is no less the case for asylum seekers. The ACT Government appreciates that asylum seekers have had to endure tremendous emotional hardship and we want to provide you with help as you continue to adjust to your new lives. 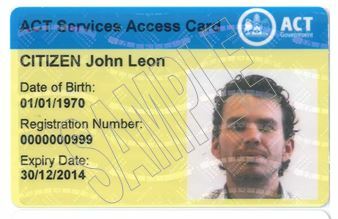 The non-government organisation Companion House is authorised by the ACT Government to issue the ACT Services Access Card. Its offices are found in the northern Canberra suburb of Cook. Its phone number is (02) 6251 4550 and its address is 41 Templeton Street, Cook. Its website is www.companionhouse.org.au and its email address is info@companionhouse.org.au. You do not have to get an ACT Services Access Card. The card is designed to make it easier for you to use the services available but it is not compulsory. If you lose your card, you should report it to Companion House immediately (see contact details above) and you should also contact them when your card is approaching its expiry date (each card is valid for six months). You should also contact Companion House if your circumstances change, for example if your visa status changes, and you cannot transfer your card to family or friends. Policy: To provide asylum seekers with access to public transport through concession rate bus fares to ensure they are able to fully participate in our city. Service description: All holders of the ACT Services Access Card are eligible for concession fares. MyWay cards can be ordered online or purchased from MyWay recharge agents Access Canberra Shopfronts; and MyWay Centres. Please contact the MyWay Office on 13 17 10 to find the location of your nearest MyWay outlet. A minimum of $5 cash, or $20 via EFTPOS or credit card, will need to be placed on the card at time of purchase. To enable travel on Transport Canberra buses at concession fare rates, ACT Services Access Card holders will be required to update their MyWay cards to acknowledge their entitlement. To do this, concession holders should complete an application for a concession MyWay card and bring it to a MyWay Centre in Civic or Belconnen, or to any Access Canberra shopfront. Concession holders will be required to present their ACT Services Access Card as proof of their entitlement to staff, who will then update their MyWay card for use. Policy: Providing asylum seekers with easier access to ACT town centres through a transfer agreement with Transport Canberra Buses. Service description: QCity transit provides concession bus fares for Oaks Estate residents transferring between QCity Transit services and Transport Canberra Buses. Oaks Estate residents are entitled to use their MyWay to transfer between QCity Transit and Transport Canberra buses. Present your Transport Canberra bus ticket or MyWay card to the QCity Transit driver within 90 minutes of purchase and provide proof of your Oaks Estate address. Policy: The ACT Taxi Subsidy Scheme subsidises the transport costs of eligible individuals who are unable to use public transport due to severe or profound activity limitations. This supports social inclusion and economic participation of community members who would otherwise be at risk of social isolation. Service description: The ACT Taxi Subsidy Scheme is available to those only with a demonstrated medical need. If you or a family member have a severe disability that prevents them from using public transport for a minimum period of 6 months, you may be eligible to access the Taxi Subsidy Scheme. Travel can be by regular taxi or a wheelchair accessible taxi where required. For more information on ACT Government Concessions, including those administered by other Government agencies, visit phone Access Canberra on 13 22 81. Policy: The ACT Government, through the ACT Education and Training Directorate, provides high quality education services which are available for all children in Canberra, including asylum seekers. Service description: Where eligible, asylum seekers may apply for a fee waiver to cover the costs associated with their children’s enrolment in local public schools. Asylum seekers who wish to enrol their children at an ACT public school should first contact the ACT Centre for Teaching and Learning. If you wish to enrol your children at an ACT Public School, phone Ms Nicole King, Manager, Centre for Teaching and Learning, on 02 6205 6998. Policy: Canberra Institute of Technology (CIT) offers a range of classes in English language. English language classes and courses are available for people with different levels of English. They prepare you for work or study. To enrol you will first need to be assessed for eligibility. If you are eligible and there is availability in the program, you will be able to access one semester (from February to June) or (from July to December) of classes. Policy: To provide asylum seekers with access to information and other library services to help with their acclimation into Australian culture and the Canberra way of life. Service description: ACT public libraries provide free English classes for all asylum seekers as well as the standard range of library services such as book borrowing, internet access and social groups. Policy: The Public Trustee exists to provide permanent and secure trustee and administration services to all members of the ACT community. It has discretion to discount or waive fees for reasons of hardship, and other circumstances, taking into account the complexity of the estate administered. Service description: All holders of the ACT Services Access Card can access Public Trustee services, including services to prepare a will or enduring power of attorney direction. The Public Trustee of the ACT can help wil Will preparation and Enduring Power of Attorney preparation; phone 02 6207 9800 for an appointment. You will need to bring your Access Card with you. If you need an interpreter, please advise the Public Trustee office in advance. Policy: To ensure asylum seekers who are Medicare ineligible are not deterred from seeking medical care because of an inability to pay fees. Service description: Medicare ineligible asylum seekers are entitled to full medical care including pathology, diagnostic, pharmaceutical and outpatient services in the ACT’s public hospitals, as per Health (Fees) Determination 2007 (No 1). Patients receiving these services will not be billed. Medicare ineligible asylum seekers are also given the same access as Health Care Card holders, to public dental and community health services. However, some of these may incur a cost. For serious illness or injury requiring urgent attention, phone 000 for an ambulance or go to your nearest emergency department at Canberra Hospital or Calvary Hospital. Asylum seekers (including those without Medicare access) are very welcome at the Companion House Medical Service and are seen at no cost. For enquiries or to make an appointment phone 02 6251 4550. You can access Companion House Medical Service by visiting the office at 41 Templeton Street, Cook, ACT. Medicare ineligible asylum seekers are also to be given the same access as Health Care Card holders, to public dental and community health services (some of which may incur a cost). Policy: Companion House works with people who have sought refuge in Australia from persecution, torture and war related trauma, including through the provision of medical services and referrals for adults, young people and children. Service description: Companion House medical services can provide general practice and primary health services for individuals in their first 12 months in Australia. Patients can then continue to use Companion House medical services until a community GP for referral is found in their local area.